Page added in April 2017. Photos taken in August 2016. The city of Benevento is well built, and contains several good houses; but its most populous streets are also the most narrow, and their steepness is such that many are impassable for a carriage; (..) I had a letter of recommendation to Marquis Pacca; and, as I had sent it to him immediately on my arrival at the inn, I had scarcely time to proceed through a few streets in search of sights, before I met him in his carriage, and he very obligingly took me to visit all that was worth observation, beginning with the celebrated arch of Trajan. Benevento is situated on the slope and at the point of a hill between two narrow valleys in one of which runs the river Sabato, in the other the Calore. Below the city they unite into one stream. 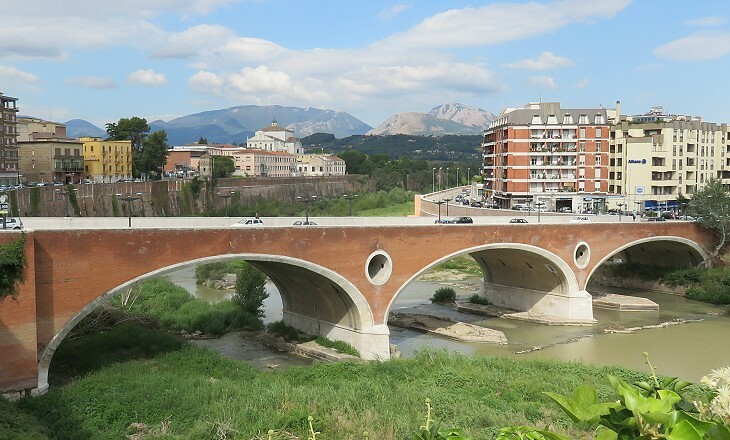 Contiguous to the Porta Aurea (Trajan's Arch) is a magnificent bridge thrown over the Calore by Vanvitelli. 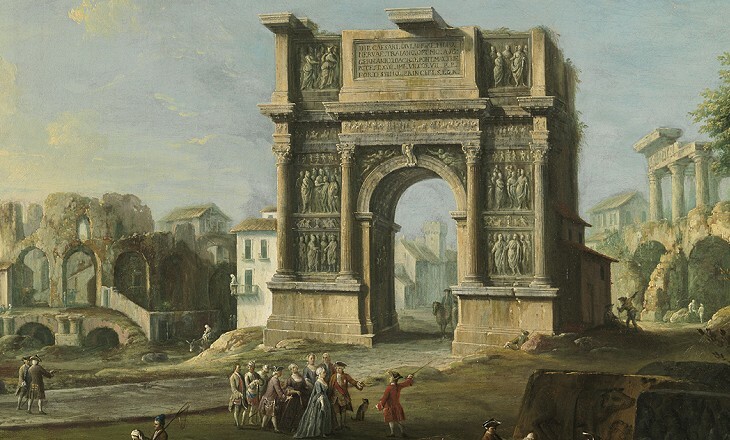 There are numerous and splendid antiquities still remaining at Beneventum; one of which, a triumphal arch, surpasses any of those in the imperial city of Rome. It was erected to the honour of the Emperor Trajan, who contributed largely to the roads, bridges, and other public buildings in this district. (..) It is very richly decorated with well-sculptured bas reliefs, equal in size and beauty to those which formerly adorned his forum at Rome, and which were removed and newly disposed in the triumphal arch of Constantine. Sir Richard Colt Hoare - A Classical Tour through Italy and Sicily - published in 1819, but Colt Hoare visited Benevento in 1789, after having seen Grotta di Tiberio at Sperlonga. 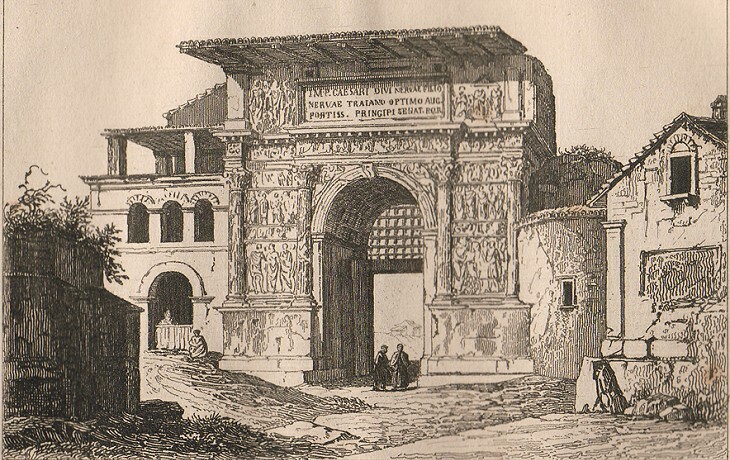 We entered through the arch of Trajan now called the Porta Aurea which appears to great disadvantage from the walls and houses that hem it in on both sides; however it is in tolerable preservation and one of the most magnificent remains of Roman grandeur to be met with out of Rome. The architecture and sculpture are both singularly beautiful. This elegant monument was erected in the year of Christ 114 about the commencement of the Parthian war and after the submission of Decebalus had entitled Trajan to the surname of Dacicus. The order is composite, the material white marble, the height sixty palms, length thirty seven and a half and depth twenty four. It consists of a single arch the span of which is twenty palms, the height thirty five. On each side of it two fluted columns upon a joint pedestal support an entablement and an attic. The intercolumnations and frieze are covered with basso relievos representing the battles and triumph of the Dacian war. Swinburne refers to a new route of Via Appia which was opened at the initiative of Trajan and is known as Via Appia Traiana. The old road reached Brundisium (Brindisi) via Tarentum (Taranto), the new one did so via Barium (Bari) and it reduced the length of the section across the Apennine Mountains. The Emperor made improvements also to the initial section of Via Appia, e.g. at Terracina. A similar relief decorated Arco di Tito which was completed some thirty years before that at Benevento. The decoration of the latter has many points in common with that of the former. 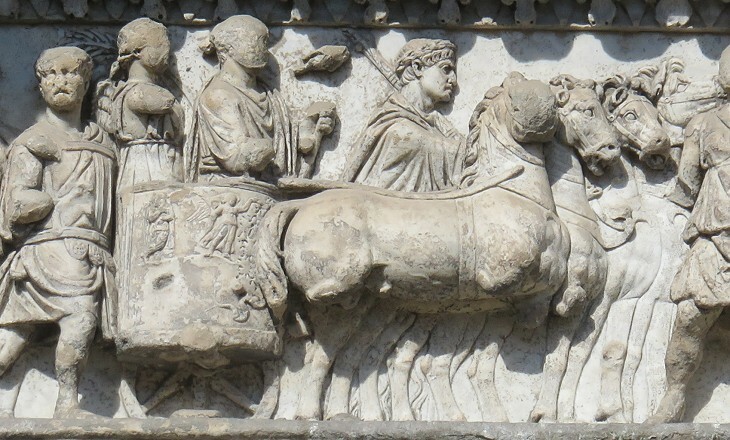 The triumphal procession is most likely a depiction of that which occurred in 106 after the second Dacian War. Upon Trajan's return to Rome ever so many embassies came to him from various barbarians, including the Indi. And he gave spectacles on one hundred and twenty-three days, in the course of which some eleven thousand animals, both wild and tame, were slain, and ten thousand gladiators fought. 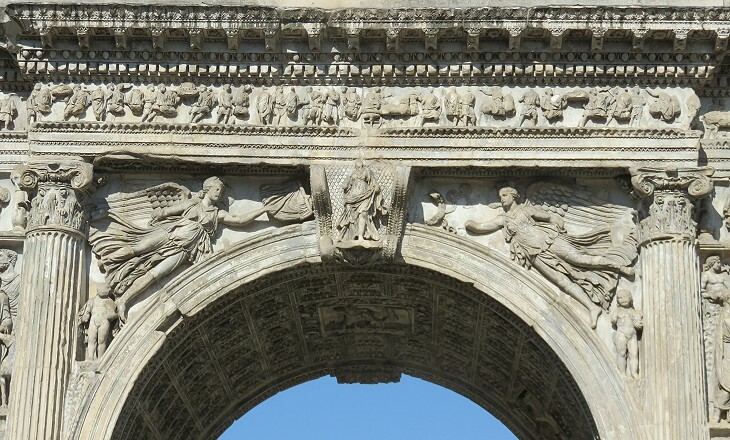 A relief showing the emperor carried to Heaven by an eagle decorated Arco di Tito, but the arch at Benevento was built and almost entirely decorated when Trajan was still alive and therefore the subject of the relief was modified to show the emperor crowned by a Victory. 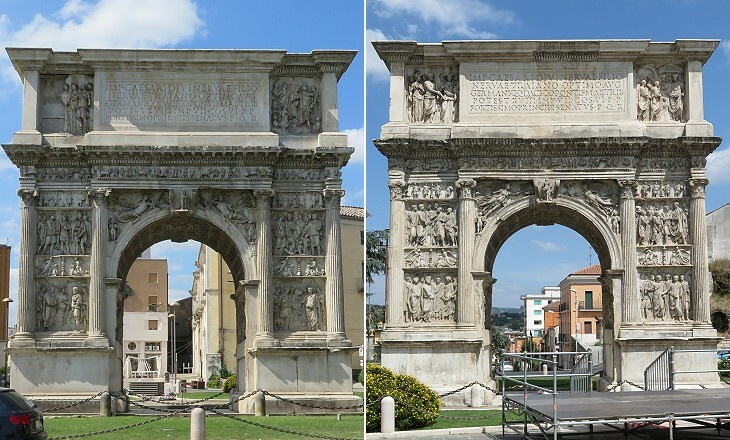 While the reliefs of Colonna Traiana were all related to war events, those of the arch at Benevento did not include scenes of actual fight. 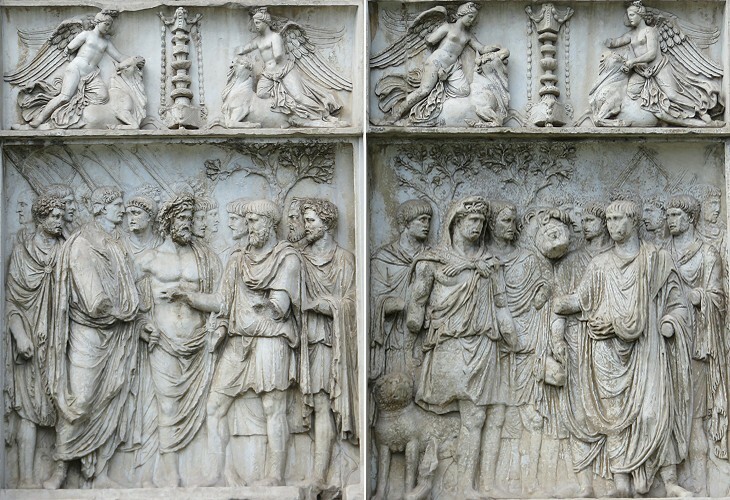 Art historians had different opinions about the events the reliefs depicted. 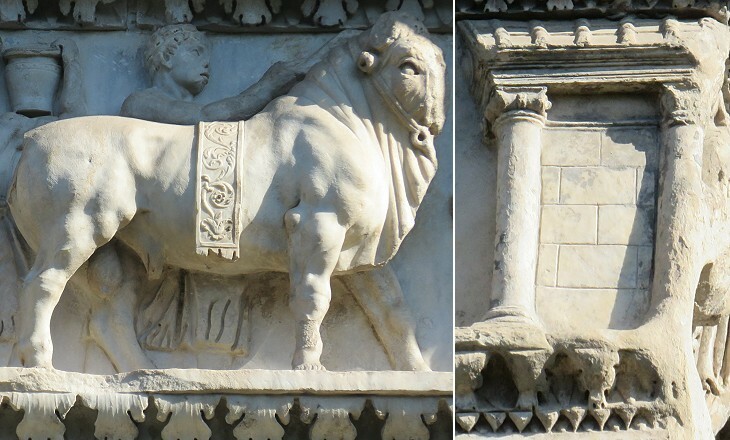 In 1889 Almerico Meomartini, an architect and archaeologist living at Benevento, published a detailed analysis of the reliefs, which to some extent is still regarded as the most reliable one. 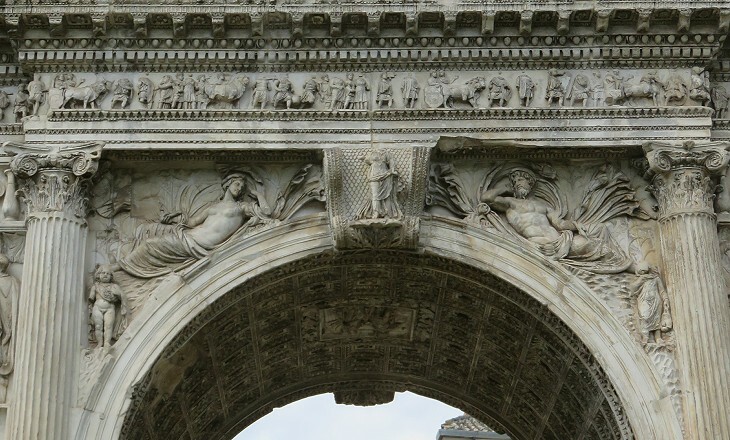 He suggested that the town side of the arch was to be seen first because it was decorated with small putti holding symbols of spring and summer, the first two seasons of the Roman year. He also noted that the town side reliefs were related to Trajan's initiatives in improving economy and welfare, while those on the external side had more to do with his military campaigns in Germany and Dacia which are mentioned in the dedicatory inscription. Other archaeologists say they include references also to the last campaign of Trajan in Mesopotamia. On the day of the distribution, it had been the custom for swarms of children, the populace of the future, to watch for the emperor's public appearance and line his path. Pliny the Younger - Panegyricus Traiano - XXVI. According to Meomartini this relief depicts a congiarius, a free distribution of bread, oil, wine and sometimes money. It could more specifically celebrate Institutio Alimentaria, a decree issued by Trajan in 103 to provide assistance to children in need. The portrayal of children in this relief brings to mind that at Ara Pacis Augustae. 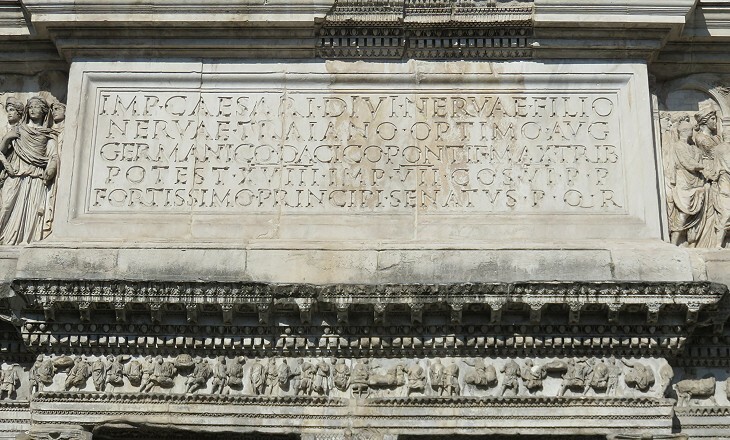 Emperor Augustus was keen on not being portrayed exclusively as a military commander, but also as Pontifex Maximus, the Highest Priest of the Roman Republic, a lifetime title which appears also in the dedicatory inscription to Trajan on this arch. 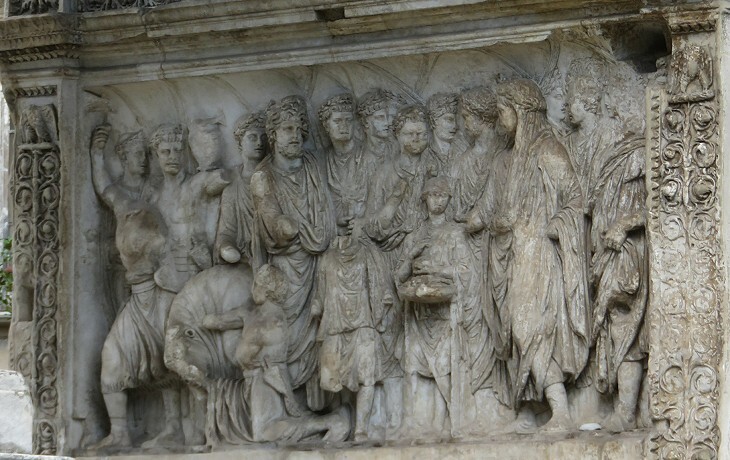 In this relief the Emperor attends a ceremony at the end of which a bull will be sacrificed, perhaps it shows the inauguration of the new route of Via Appia. 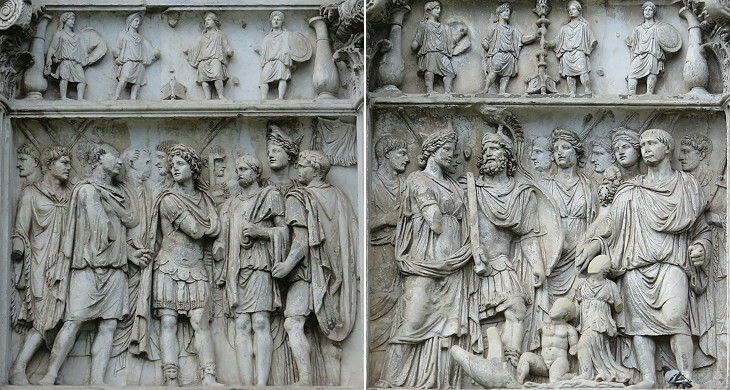 The two panels form one scene: Trajan is portrayed in the right panel at his return to Rome after a victorious campaign against the Germans in 99 and he is moving towards Curia Julia where he is greeted by a personification of Genius Populi Romani and Senators. It could also be a celebration of Trajan's activities in the judiciary field and the construction of tribunals at Basilica Ulpia. Trajan was renowned for his interest in justice and for being personally involved in ensuring cases were not forgotten. He was given the title of Optimus (The Best) by the Senate. According to a traditional account reported by Dante this good fame eventually allowed him access to Purgatory. It might have preserved the reliefs of the arch from being defaced on purpose. On the third day an investigation was entered upon, which had been the subject of a great deal of talk and a variety of reports. It related to some codicils of Julio Tiro, part of which were admitted to be genuine, while part were said to be forged. (..) The heirs, while Caesar was in Dacia, had requested him in a joint letter to undertake the investigation. He had consented, and on his return had appointed a day. According to Meomartini the left panel shows Trajan discussing the case of Julio Tiro. The right panel is believed to be a celebration of Trajan's initiatives in favour of trade, because the three gods in the background are supposed to be those who protected this business, but only Hercules is clearly identifiable. You may wish to see a Temple to Hercules built in a Roman neighbourhood where tradesmen congregated. 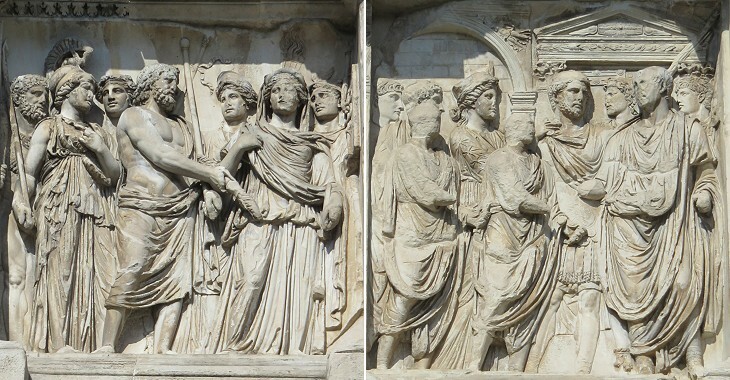 The prevailing interpretation assumes that the two panels are part of the same scene which shows Trajan (right panel) entering the Capitol where he is greeted by Minerva, Jupiter, Juno and other four gods (left panel). Archaeologists concur in identifying Hadrian in the bearded man in the right panel. A woman (Rome or Plotina, Trajan's wife) points to him with her hand while she looks towards Trajan. It is likely that this relief was completed after the death of Trajan in 117 and was meant to support the legitimacy of Hadrian's accession to the throne. The river on the right side is generally believed to represent he Danube. It could be associated with both the German and the Dacian campaigns of Trajan. The river on the left is either Sargetia or a representation of Mesopotamia, the land between two rivers which Trajan conquered in his last campaign. On the approach of the Roman army, led to victory by Trajan, Decebalus caused the Sargetia, now Istrig, to be turned out of its regular course, and buried an enormous mass of gold, silver, and jewellery in a kind of cave which had been built for that purpose in the middle of the dry bed. The river was then restored to its natural channel, and all the men who had been employed in this extraordinary work were slain by Decebalus, in order that the secret might be safe from indiscreet disclosure. The secret, however, was revealed to Trajan by the king's intimate confidant and adviser, Beryx; and the Romans found in the cave money and valuables enough to defray all the expenses of that costly war. 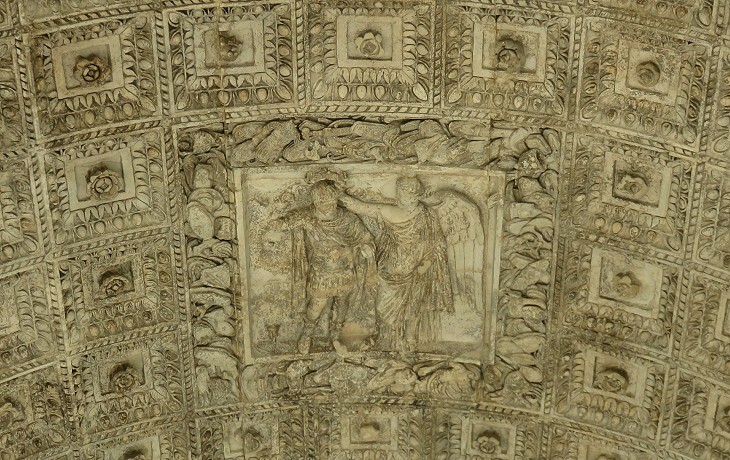 The left panel shows Trajan receiving the surrender of an enemy at the presence of Jupiter. The depiction of the surrendering leader does not fit with the traditional iconography of the Dacians or of the Parthians who both wore trousers, so that it has been suggested that the reference is to an event of the German campaign. He always marched on foot with the rank and file of his army, and he attended to the ordering and disposition of the troops throughout the entire campaign, leading them sometimes in one order and sometimes in another; and he forded all the rivers that they did. Cassius Dio. 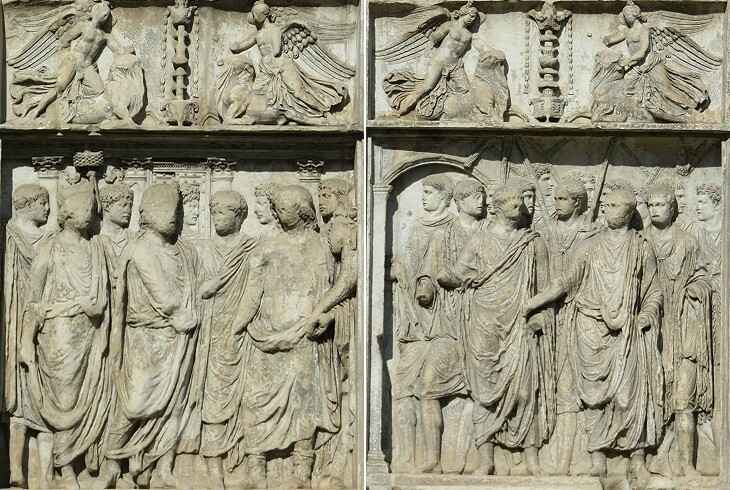 The right panel shows Trajan in the act of walking with his men. The other personage in the panel could be a young Hercules. The fact that Trajan is not in military attire could be a reference to Pliny's panegyric which says that the Emperor relied more on exhibiting his toga (the formal garment for Roman citizen men) than in showing his armour. In the eastern provinces of the Empire however he was usually portrayed in his military attire. The subject of the left panel is debated. According to Meomartini it shows Hadrian, the young man at the centre of the scene, announcing the death of Emperor Nerva to Trajan while two men carry symbols of power. Trajan was unaware that he had been adopted by Nerva. Other experts suggest it represents the enrolment of soldiers. The right panel is associated with Institutio Alimentaria, the initiative taken to support children in need. In this panel there is a specific reference to the orphans of soldiers and Trajan is portrayed with Mars and a personification of Italy. 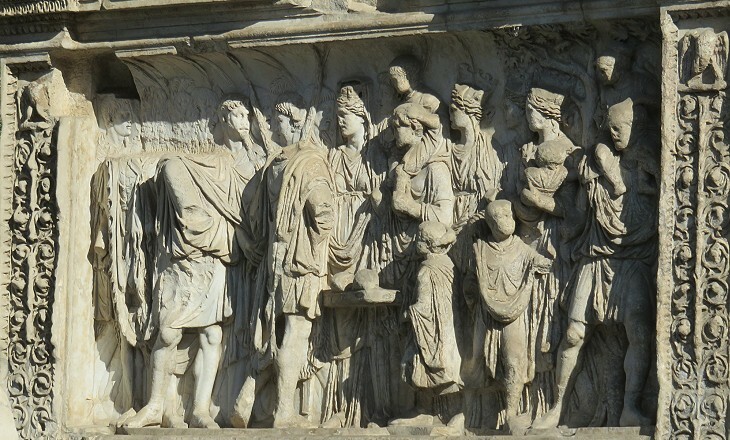 The portrait of Trajan in this panel can be seen in the image used as background for this page. The left panel is the only one which is not complete. Trajan must have been portrayed in the missing section. The four gods have been identified with Bacchus, Ceres, Diana and Silvanus, They might symbolize Pannonia, the province on the eastern border of the Empire from which Trajan moved to conquer Dacia, so the panel might have celebrated some initiatives he took in that province. 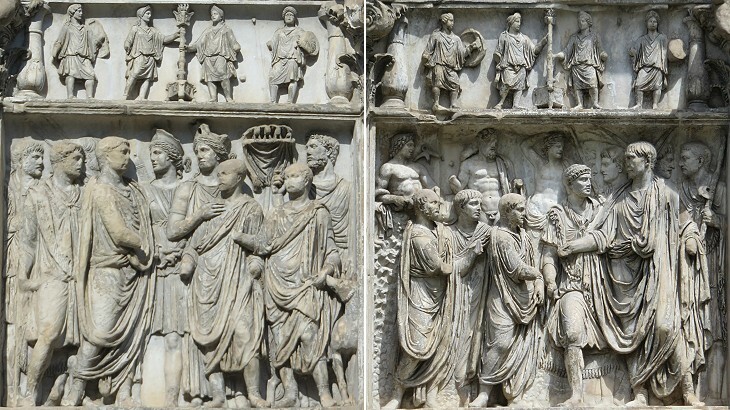 The right panel shows the submission of a conquered country to Trajan. Meomartini identifies Dacia in the young woman, Sargetia and Danube in the two river gods and assumes that the left corner of the panel shows a balustrade of the bridge built by Trajan over the Danube. Other experts believe the panel is a reference to the conquest of Mesopotamia and the rivers are the Euphrates and the Tigris. Move to page two and see other Roman monuments of Benevento or to page three and see its medieval heritage or to page four and see S. Sofia, its most interesting church.